← [Ticket Giveaway] B1A4 Road Trip to Manila! The amazing people behind the Ktown Night Market, along with Al Party and KCM Agency, are banding together and taking their show to Dodgers Stadium, sponsoring the first ever Ktown Night at Dodgers Stadium! On Friday, September 5th, baseball fans and Ktown fans alike will come together to celebrate the two great Los Angeles institutions, while also getting a great deal! You can get a ticket to the All-You-Can-Eat pavilion for $39 that night, which includes all you can eat Dodger dogs, popcorn, nachos, peanuts and soft drinks. But you won’t only receive food! Patrons will also receive limited edition Hyun-Jin Ryu bobble heads along with a coveted Ktown Black Card, which offers discounts at some of Ktown’s most well known establishments! 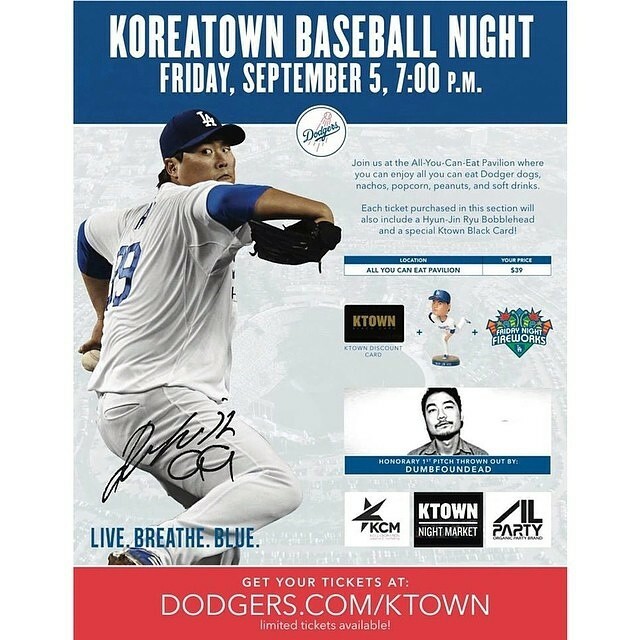 There also promises to be a slew of celebrity appearances, headed by Ktown native and rapper, Parker aka Dumbfoundead, who will also be throwing the honorary first pitch at the game vs. the Arizona Diamondbacks. But when the game is over, be sure to stick around for the famous Friday Night Fireworks! Hope to see everyone there!